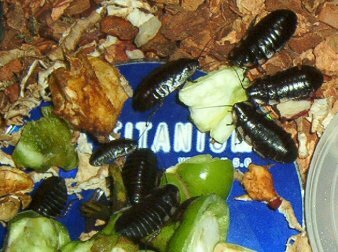 Description: These are a few of my baby Madagascar Hissing Cockroaches as they have green pepper and an apple core for dinner. The cockroaches in this picture range from 2 to 4 months old. The terrarium floor is wood chips, and their blue colored food dish is an AOL 9.0 Titanium CD (those things can be useful, once in a while).